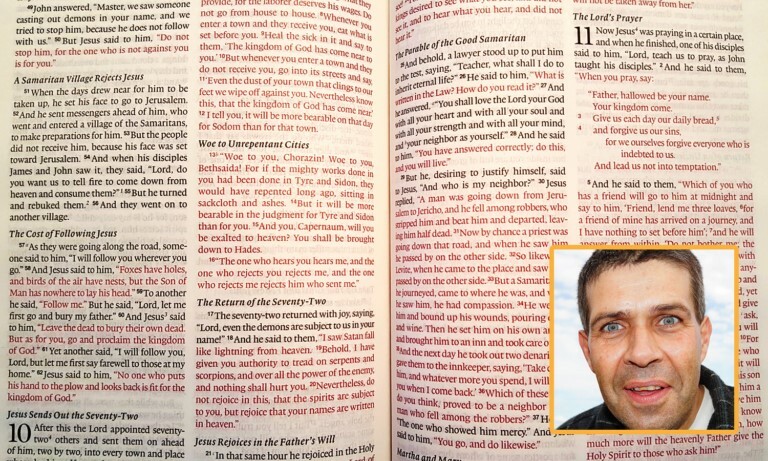 Local man Brian Reed was startled Monday to learn from an internet search that the black letters in his Bible are every bit as authoritative as the red letters. The above story is from The Babylonian Bee, billed as “Your trusted source for Christian News Satire.” In other words it’s fictional, not factual. The Bee, created by Adam Ford and launched in March of 2016, has been received with mixed reviews. However, it often exposes some commonly held, but misguided ideas both in culture and among the evangelical community. This notion that the “red letters” are more valuable than the “black letters” because they are the words of Jesus, is one that I’ve encountered through the years. Numerous Bible passages expose the error of such an idea. Following the last supper, Jesus promised the apostles that the Holy Spirit would come upon them after he ascended back to the Father (John 14-16). There are 7 things He said the Holy Spirit would do for them. (6) The Spirit would also reveal “things to come.” (Jn.16:14) Future events. The falling away. The hope of heaven. And the fate of the unbeliever. (7) In summary all that the Spirit did for the apostles would glorify Jesus as the Christ (Jn. 16:14). This short summary is pregnant with meaning and implications that are far reaching. Greater in application than a blog post. They underscore the affirmation of Paul in 2 Timothy 3:16-17. He further affirmed that his source of writing was via the Holy Spirit. “How that by revelation He made known to me the mystery (as I have briefly written already, by which, when you read, you may understand my knowledge in the mystery of Christ), which in other ages was not made known to the sons of men, as it has now been revealed by the Spirit to His holy apostles and prophets” (Eph. 3:3-5). Both the red and black letters are God-breathed. All are authoritative. Equal in importance. Identical in source. And harmonious in doctrine. I had a good friend (now deceased) who said regarding the red and black letters, The red letters are the words God spoke while on earth; the black letters are the words God spoke from heaven.